Hi friends!! Wow, I can't believe we are wrapping up March this week! Today I am linking up with Shay. Mel and Sheaffer for What's Up Wednesday.....March Edition. A fun monthly post where we answer these questions, and one bonus question😉. A little recap of what is up with us this month! Well last week I shared a post all about some plant based meals... and these have been some of our favorites. Well since there is still snow on the ground here, and there is snow in the forecast, I am definitely reminiscing about our trip to the beach last month. Sun and sand does wonders for the soul! You can check out the details from our trip here. Probably like everyone else I am loving these longer days. The daylight after dinner is so nice! Luke has been taking full advantage and getting in some extra hoops! We had fun celebrating Maddie's 3rd Birthday. And we had a fun St Patrick's Day checking out our favorite Irish dancer! Luke is making his First Communion next month, so I am working on some fun party ideas to celebrate his special day. Here is a peek at what we did for Ella's special day. Luke's baseball season is going to be starting next month and I cannot wait to watch him play. It's his 6th season playing (he stared when he was 4!). This year the kids pitch so it's literally a whole new ball game! This is still one of my favorite pictures. His first year playing and the highlight was tossing candy out to the crowds! I love me some college basketball, so we have been taking in all the March Madness here this month! It has been such a fun tournament to watch and can't wait to watch the last few games this weekend. As for reading, I have had a slow month in that department! I read 6 great books last month and then I just kind of lost my reading groove this month. But I have a stack of books ready to read... so look out April. If you are in need of a great book, check out my February Book Review here. I am happy to report that this week I have been listening to birds chirping!! That must mean that Spring really is coming! I have nothing exciting to report here. I feel like I have the same black pants and grey sweaters on repeat... with my black ankle booties....desperately awaiting warmer weather! So this weekend is egg coloring & Easter Brunch! Look at those little faces! And Luke will make his First Holy Communion! Whew... I feel like it will blink and it will be May! Not much, I think I covered everything!! Gosh this is hard to break it down to one. I shared some of our favorites in a post here. 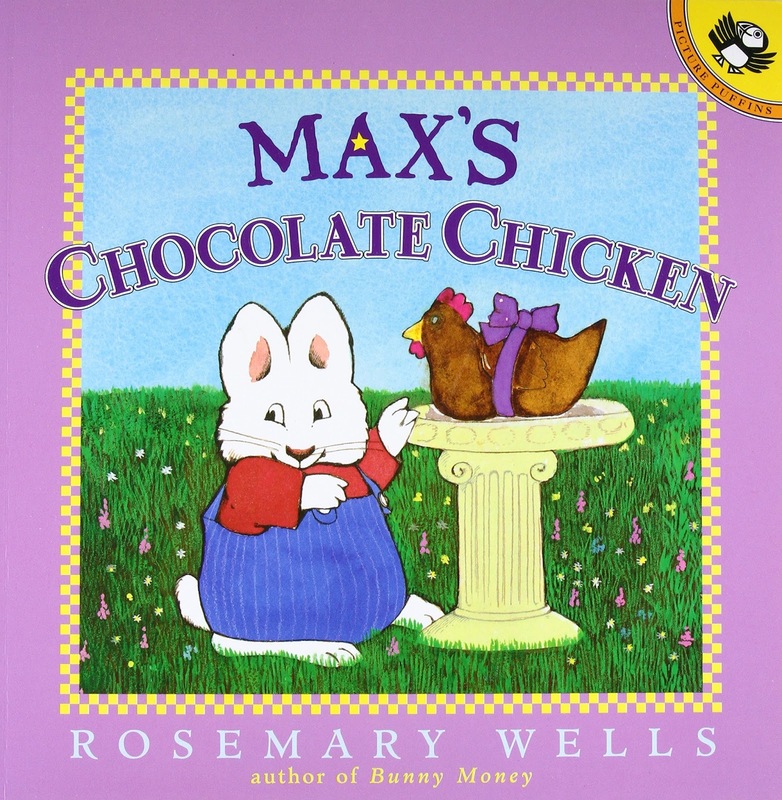 But if I have to narrow it down to one, I think it would be the Chocolate Chicken. 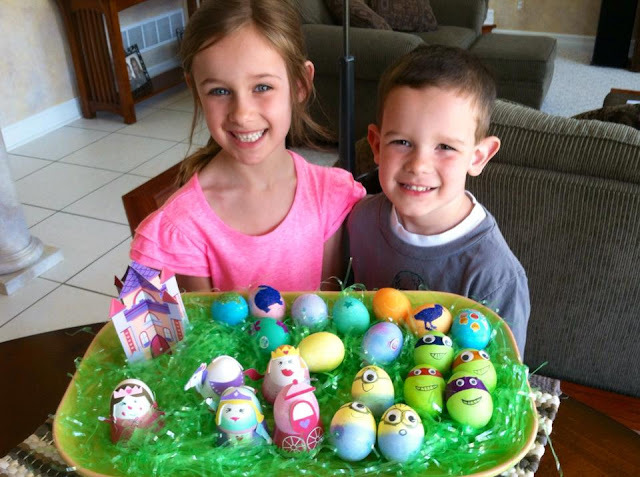 When Ella & Luke were little (4 & 3 years old) they loved the show Max & Ruby. In the Easter story for that show, they got a chocolate chicken instead of a bunny. I guess the bunnies eating a chocolate bunny was odd. Anyway about 3 days before Easter Ella was so excited because she was going to get a chocolate chicken from the Easter Bunny! 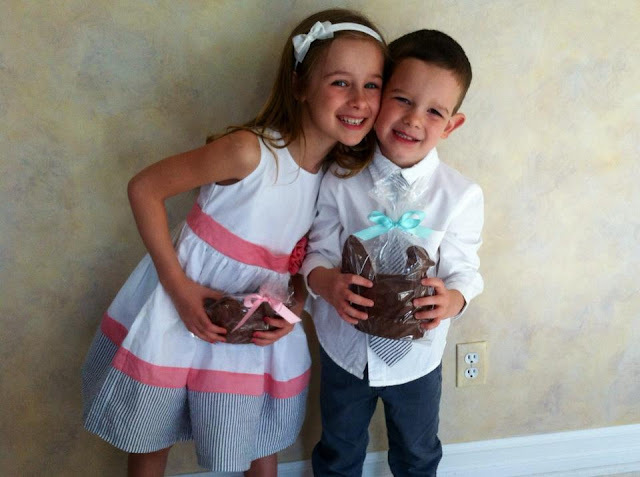 So needless to say, the Easter Bunny had a great team of helpers to find a chocolate chicken for Easter morning with 72 hours notice. So every year since then and probably every year I am alive, my kids will get a chocolate chicken every Easter! I hope you and your families have a wonderful Easter!!! See you soon....there's always room for one more at our family table.